Homemade Vegan Marinara Sauce made with 9 different types of tomatoes. Made with all natural ingredients and a ton of garlic. Serve with pasta or on pizza. So, why is this marinara sauce “magical”? It came out so great despite having so many tomatoes that were past their prime. 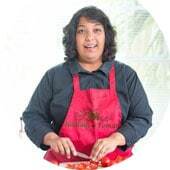 Do you tomatoes ever get to the point where they are really ripe and will begin rotting in the next minute if they are not used? They had gotten very ripe and I almost thought of throwing them out. Then, I thought better of it and decided that I should at least try to make something out of them. I am a huge lover of pasta. Pastas of any variety always gets my attention. I have never said no to a vegetarian pasta recipe. 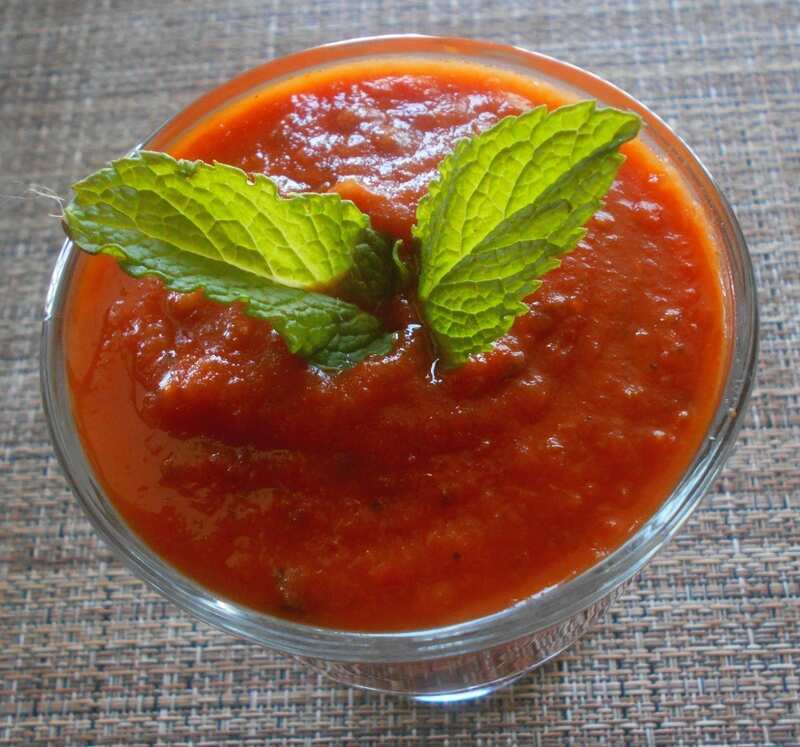 Marinara sauce is such an integral part of any Italian recipe. 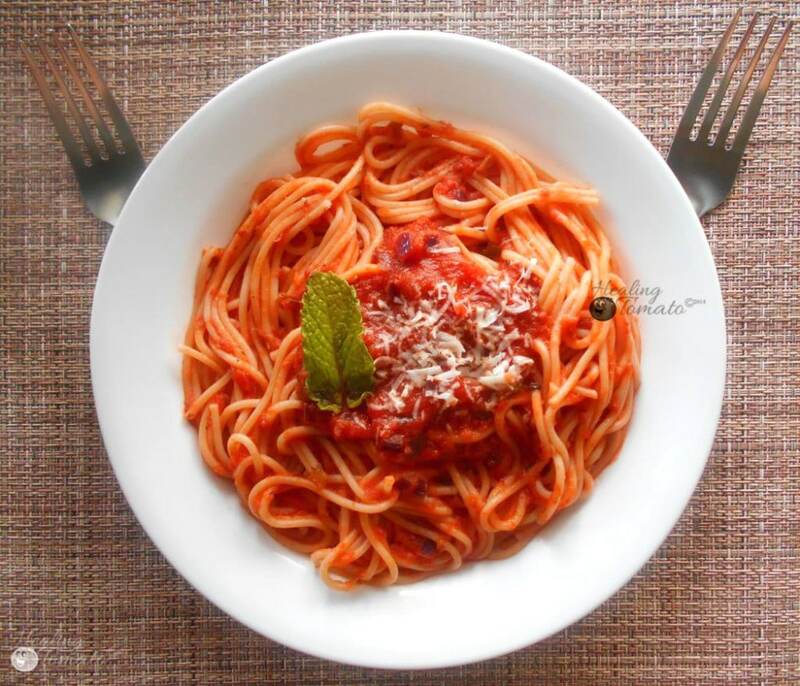 The beauty of a good marinara sauce is that it can be enjoyed be vegetarians, vegans and meat lovers alike. Italian food is all about family and sharing. Different people from different walks of life can come together and share a simple meal of spaghetti with marinara sauce. Everyone would go home happy. 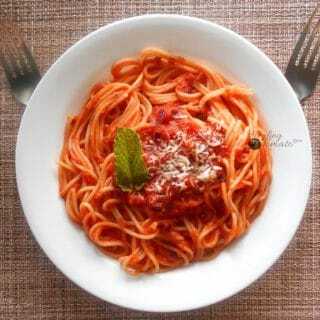 That is why I decided to blend all tomatoes with all different kinds of flavors come together in this sauce. The oregano and basil were so perfect in this recipe. I can’t believe how amazing the flavors rounded out. I put mint garnish and that caused some controversy. Apparently mint doesn’t go well with marinara sauce? Personally, I loved it. No complaints from me. This particular marinara has a not-so-secret ingredient. I added a little sweet vermouth to this recipe to take away some of the tanginess from all the tomatoes. It was a nice way to balance out the flavors without the use of sugar. The sweet vermouth is the perfect ingredient for that task. Don’t worry, the sweet vermouth burns off and you don’t have to worry about getting drunk. Your eyes are not deceiving you. That is actually a can of tomato sauce. 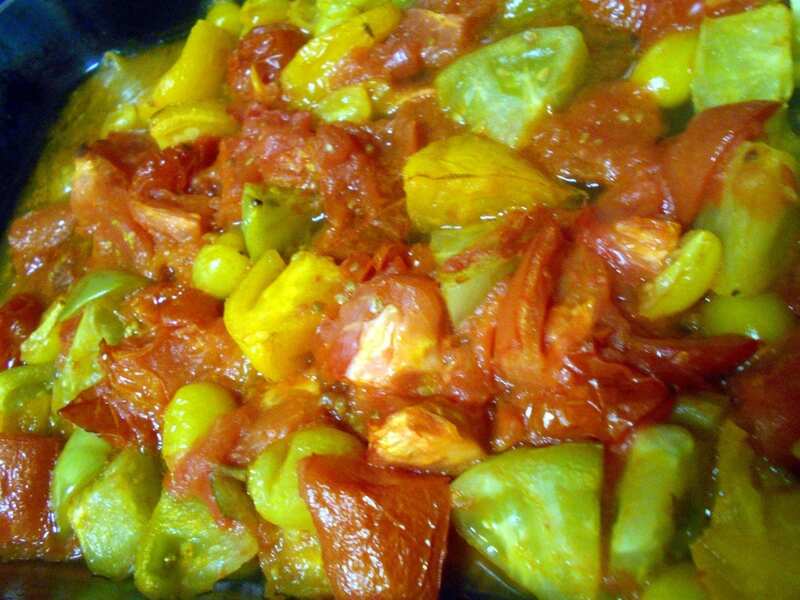 Fresh tomatoes are great in taste for this recipe. However, the canned tomato sauce actually provides a little depth and texture to this recipe. You only need half a can for this recipe, but, it will do the trick. 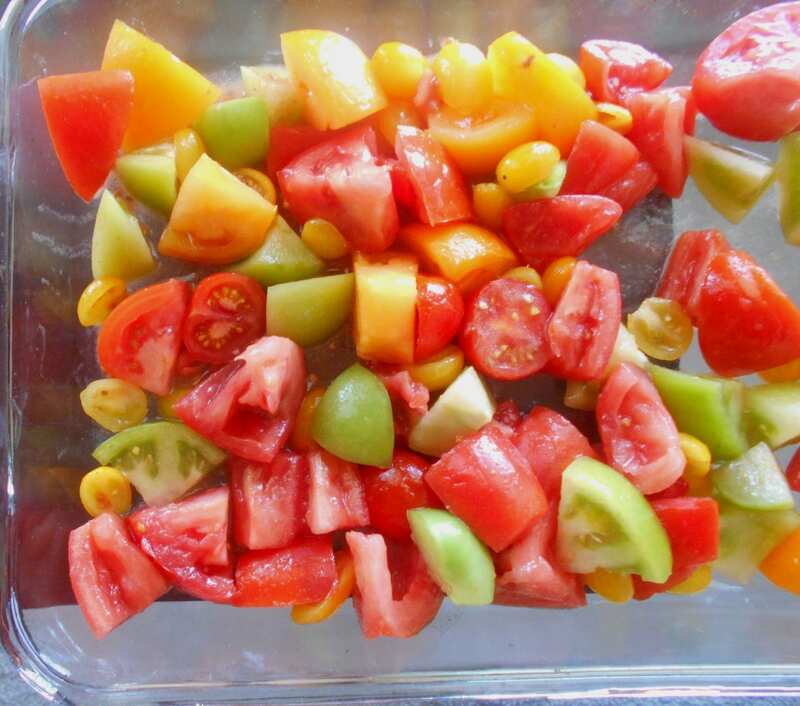 See all that color and wholesome goodness of all those tomatoes? That color is so pleasing to the eye that you cannot stop looking at it. This is what the roasted tomatoes look like after thirty minutes in the oven. You will be tempted to just reach in there with your hands and pop one into your mouth, right from the baking dish. It is okay to do so, but, don’t be an idiot like me and forget that these tomatoes are HOT!! When it comes to tomatoes, I foolishly tend to throw all logic out the window. Drizzle with extra virgin olive oil and add 1 tsp of salt. Use your hands and mix the tomatoes well. Add the onions and red chili flakes. For best results, refrigerate the sauce overnight. What is that? I could not get around it or beyond it! Please sign me up for your blog! So happy I found this post. 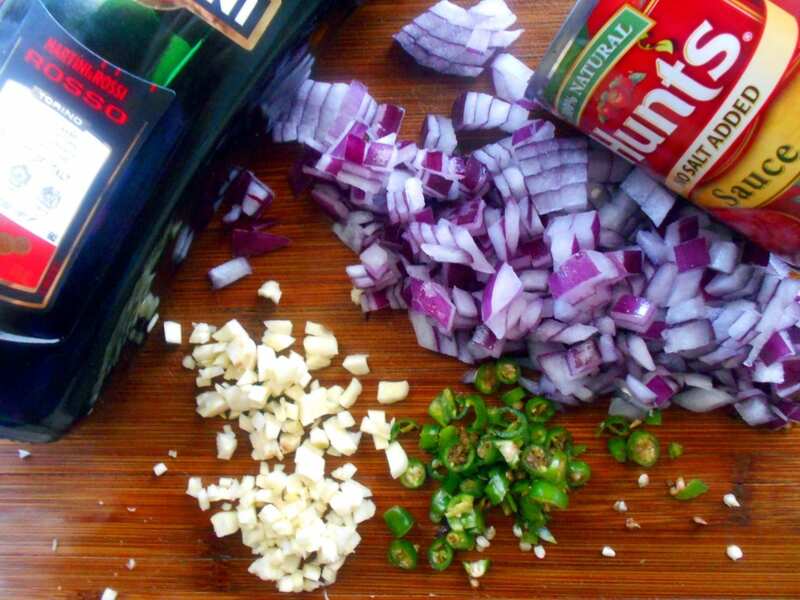 You use a few different ingredients in your sauce that I am accustomed to, but I love it. I could sit and enjoy a big bowl of this. I know it will sound odd, but I bet this tastes utterly amazing the next day, cold out of the fridge. Thank you, Michelle. I kept it in a jar and it lasted a whole week. It felt like the sauce got better with each day. Definitely worth a try. Your writing is lovely! I cant wait to try this recipe and check out the rest of your blog. Pinning! Thank you Gwen! Wow! I have never tried black cherry tomatoes for marinara, so, I am curious to know how they turn out. Let us know. The tomato sauce photos looks pretty good. Can you tell me where you get the fresh tomato. Thank you. We reside in Florida and therefore, the tomatoes are abundant year round. We get varieties from all over the country plus we happen to know some local tomato farmers who sell us their produce occasionally. Your pictures are definitely getting better. This picture is setup well. Only, your left side of the pic is darker. Quick Photoshop should fix it. Thanks, P. I am working on making my pics better. Learning slowly on how to make them better. I will take your advice and lighten the left side a little more. love this recipe. It is very creative. I also like to freeze my tomatoes and use them in the winter when there aren’t too many fresh tomatoes to buy. Thank you very much, P. Freezing tomatoes is a GREAT idea. Unlike me, I am sure you remember to thaw out the tomatoes about half hour before you start cooking.